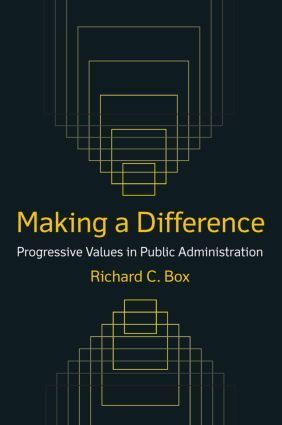 This inspirational work encourages Public Administration professionals to participate in progressive social change by advocating progressive values to counter the regressive values currently dominant in American society. The book begins with an analysis of regressive and progressive societal values, and then discusses specific actions PA practitioners, scholars, and teachers can take to build awareness and use of progressive values. The author presents regressive and progressive values in five matched pairs, each representing a continuum of thought and action: aggressiveness and cooperation; belief and knowledge; economics as end, and economics as means; great inequality and limited inequality; and Earth as resource, and Earth as home. Preface; 1. The Case for Progressive Values; Making a Difference; Regressive and Progressive Values; A Conceptual Framework; 2. Describing the Value Pairs; Aggressiveness/Cooperation; Belief/Knowledge; Economics as End/Economics as Means; Great Inequality/Limited Inequality; Earth as Resource/Earth as Home; 3. Practice and Change; The Public Professional as Agent of Change; Creating Change in Policy and Practice; 4. Normative Teaching and Scholarship; Beyond the Given: Normative Thought in Public Administration; Against the Grain: Teaching Progressive Values; Acceptance and Refusal: Analysis of Current Conditions; Contingent Theory; 5. Toward a Progressive Future; "Small Junctures of Theory and Practice"; References; Index; About the Author.